How to convert TS to MKV for playback with VLC Media Player? 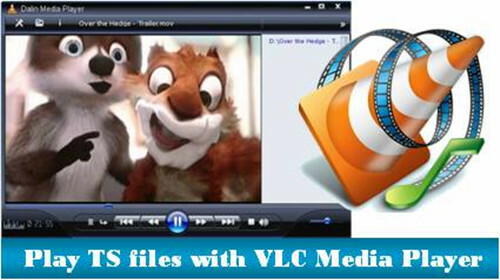 Home » How to convert TS to MKV for playback with VLC Media Player? Wonder how to make it possible when enjoying the TS files on VLC media player? Just relax and next we are going to discuss how to smoothly get rid of the troubles of importing TS to VLC media player for playback. Are there personal TS to VLC solutions? "I got a .ts file and have heard VLC can play this file type. However, I have no luck, can someone tell me how please?" Have you ever asked the same question, but haven’t figured out how to play the TS files with your VLC player? MPEG transport stream (TS) is a standard format for transmission and storage of audio, video, and data, and is used in broadcast systems such as DVB (Digital Video Broadcasting) and ATSC (Advanced Television Systems Committee). Actually, TS is a container and not a format, like Matroska (MKV), you can put almost anything in a TS container. If the codec used to encode the TS files is not supported well by your VLC player, you are of course unable to play it successfully. Thus just don't expect any player to play TS files. By then, the best solution for you is just converting TS files to other file type that is compatible with VLC player. 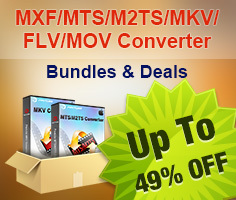 Here Pavtube Video Converter can be your first choice. The guide below will show you how to convert TS to MKV for playback with VLC Media Player in detail. Just feel free to check it. How to playback TS files on VLC without hassle? The program supports batch conversion, so you are allowed to add multiple files to convert at a time. Meanwhile, if you wanna combine several files into a single file, you can tick off the checkbox "Merge into one file". To process TS to MKV conversion, you need click on the dropdown list of "Format" to select MKV as output format. To convert TS to MKV for VLC with standard quality, you can select the "MKV (Matroska) Video (*.mkv)" format under "Common Video" option. 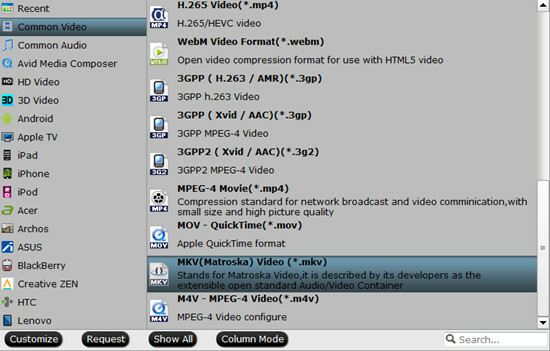 To transcode TS to MKV with HD quality, you can choose the MKV format under "HD Video" option. TheTS to MKV conversion software allows users clicking "Settings" button to adjust video and audio parameters, so as to customize the output file quality at will. The adjustable parameters include codec, size, bit rate, frame rate, sample rate, and audio channel. When the above mentioned steps are finished, you can click "Convert" button to start transcoding TS to MKV for playback with VLC Media Player. Once the TS to MKV conversion is done, you can click "Open" button to get the resulted MKV files with ease. With optimized audio and video in sync technology, Pavtube TS to MKV converter can finish conversion at speed without causing you any audio and video out of sync issues. In addition, it adopts unique built-in codec, which can absolutely ensure not to install any codec on your computers to disturb the original systems. How to Edit Canon C300 MXF recording on iMovie?